Hasegawa's recent 'Nakajima Ki27 Type 97 Fighter (NATE) '1st Flight Regiment COMBO' is a somewhat expensive re-issue of the two former Mania kits of 1970 vintage in a new box with a new and generous decal sheet (all those lovely bordered stripes!). This decal sheet incorporates the coloured rudders and elevators of the 1st Sentai and I believe this is the first time the unit's distinctive painted elevators have been correctly depicted in a kit. The undersurface elevator decals are also included, although there is uncertainty whether these were actually painted. The necessity of including decals for these markings may be questioned - they are easy enough to paint - but I suppose it is nice to have the colours exactly matching the rest of the sheet. The sheet also includes very nice stencil decals but # 61 has me mystified as I cannot seem to find it anywhere on the instructions! Of personal interest to me is the inclusion of the option for a 5th Sentai example, albeit from the 1st Chutai and not the 3rd Chutai aircraft in which Lt (later Capt) Baba of Ki-100 fame intercepted and attacked a B-25 during the Doolittle raid (his aircraft depicted in Ichiro Hasegawa's lovely painting - bottom picture). Useful because markings for this unit are not available elsewhere and they are difficult to paint. One of my long term projects is a 1/72nd scale line up of every unit flying the 97 Sen so this sheet is doubly welcome. 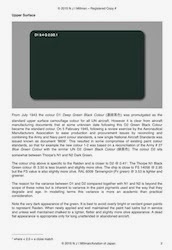 Also of interest are the painting instructions citing GSI Creos Mr Color and Aqueous Hobby Color paint ranges. A choice of 127 'Cockpit Colour (Nakajima)' or 14/H54 'Navy Blue' is suggested for the interior (the latter more probable although I have not compared this hobby paint colour to the actual standard colour). The exterior paint finish is even more intriguing because, whereas the box art appears to show the standard hobby paint "Army grey-green", the painting instructions suggest a 50/50 mix of 115 'RLM 65 Light Blue' and 128 'Grey Green' resulting in, presumably, an interesting blue-grey-green colour which may turn out to be close to the colours identified by Thorpe and the range given for 'Hairyokushoku' (ash green colour) in the Army standard. 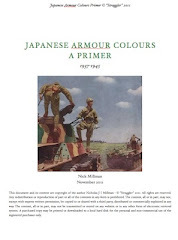 The question of whether this paint colour gave a predominantly pale green, blueish-grey or neutral grey impression - or all three - remains open as it is recalled and depicted almost equally in contemporaneous documents. Hasegawa's ex-Mania Nate has not been re-issued as many times as some other Japanese aircraft kits in the range and unfortunately no attempt has been made to improve the molding. The kit is basically sound, offering both Ko and Otsu canopy variations, together with three different wheel configurations, but suffers from a number of detail issues. The Ko rear canopy section is almost flat-topped and rectangular in section where it should be curved. The windscreen has a large slot for the optical gunsight which is a very crude molding with a solid 'tab' fixing it to the fuselage (pinch an unused one from their Ki-44 kit!). The interior is rudimentary with the seat incorporating a separate 'back' that bears no relation to the real thing and pops up out of the cockpit like a slab of armour plate. The stabilisors and elevators also need refining, being molded rather crudely in comparison to the rest of the kit. The engine is basic but is difficult to improve because of the integral horseshoe oil cooler. Having mentioned all that (and there are a few other details too) it still builds up into an attractive kit that captures the iconic appearance of the original reasonably well. And it is an enjoyable and undemanding build which rewards simple improvements. 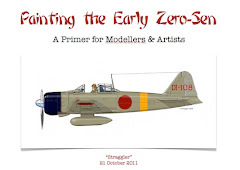 Fortunately the RS Models Ki-79 kits can also be plundered for spares to improve the Hasegawa model, such as the seat, although some may prefer to tackle the RS Models Ki-27 kits (based I believe on the Hasegawa kit) or the more recent ICM offerings to start with. The 97 Sen has been quite well served with aftermarket decal sheets. 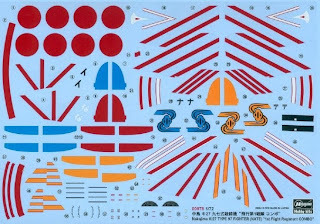 A small Techmod sheet was included with the Kagero Monograph # 11 providing a small joint sheet of 1/72nd and 1/48th markings for 97 Sen of the 11th Sentai, 2nd Chutai, 10th Independent Chutai commander's aircraft, 13th Sentai, 1st Chutai, 64th Sentai (x 2), Akeno Flying School and RTAF. However, in the case of the Japanese options the markings are limited to tail insignia and do not include the various stripes or the Hinomaru insignia. 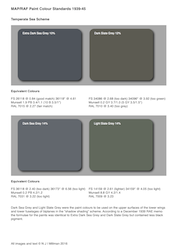 Arawasi produce a very nice decal sheet for 'Fancy Nates' 72001 (also available in 1/48th scale) with markings for four very colourful machines from the 50th Sentai and three training units. The 50th Sentai marking is splendid and particularly welcome as it would be almost impossible to paint. 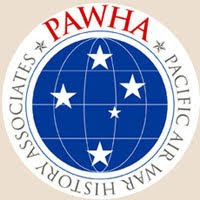 This is also a combat aircraft in the Phillipines during 1942 - a super choice. Rising Decals sheet 72010 'Emperor's Eagles Over China and Nomonhan' includes markings for three 97 Sen from the 11th, 24th and 64th Sentai. Their 'Japanese Aircraft of the Training Units' sheet 72025 offers markings for a Ki-27 trainer aircraft of 117 Kyoiku Hikotai in Java during 1944, and two colourful earlier 97 trainers of 101 Kyoiku Hiko Rentai in Japan. 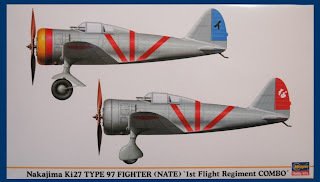 Most recently Empire City Decals have issued a sheet 'Fighters Over China' ECD7209 (also available in 1/48th scale) with markings for a very interesting caricature adorned 97 Sen Otsu of the 11th Sentai. Finally, markings for Royal Thai Air Force versions of the 97 Sen are available on the generic Axis Decal sheet AX72-003 (also available from Arawasi) and on Siam Scale's sheet # 72037 for the Ki-21, Ki-27 and Ki-30. Siam Scale decals are available here. More to come on 97 Sen kits, decals and details, including a look at the 1/48th scene. Thanks for the in-box review. The boxing is worth its price to some of us, just for the decal sheet alone.